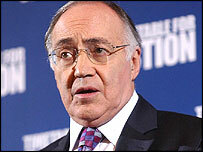 Tory leader Michael Howard has said Tony Blair leads a grubby government "low on integrity" as he attacked "lies" told in the David Blunkett saga. In his inquiry, Sir Alan Budd describes a "chain of events" linking the ex-home secretary to the speeding up of a visa application by his ex-lover's nanny. Mr Howard said the controversy again showed the prime minister's government was a "stranger to the truth". He asked: "How can you ever trust again a man that has deceived you so often?" At a news conference at Conservative Campaign Headquarters in central London, Mr Howard repeated his call for a judge-led inquiry into the controversy. There was a "gaping hole" in Sir Alan's report because he had been unable to get to the bottom of key questions. The problem with appointing a former civil servant to investigate such claims was that there did not seem to a word for "lie" in the language of "mandarins", he argued. Promising not to mince his words, Mr Howard said Mr Blunkett had lied because he had originally denied fast tracking the visa claim or his private office being involved. That was now known to be untrue. He said the affair followed a similar course to previous allegations about the Blair government and cast light on how ministers used the civil service. "He (Mr Blair) leads a grubby government, that gives favour for finance," he said. "A grubby government that is a stranger to the truth, a grubby government that intimidates people who don't agree with it. "In short, a grubby government low on integrity, light on honesty and lacking in all humility." 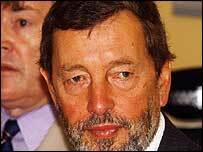 When Sir Alan's inquiry was established, Mr Blair predicted it would exonerate Mr Blunkett. That would have been extraordinary a few years ago but was now "par for the course," said Mr Howard. He denied kicking the ex-home secretary while he was down. "It's not a question of Mr Blunkett or his future, it's a question of the Blair government in its future," he said. He called for new laws to protect civil servants (something the government is already planning) and limits on the power and number of political advisers. There should also be an independent panel created to hold inquiries into such allegations. Mr Howard was asked whether his broadside on Labour could help the Liberal Democrats by reminding the public about sleaze in previous Conservative governments. He said the Lib Dems were now calling for a judge-led inquiry despite originally urging people to take Mr Blunkett at his word unless more evidence emerged. Labour branded Mr Howard's attack a sign of desperation. The party's general election co-ordinator, Alan Milburn said: "Michael Howard's desperate and wild accusations have shown clearly that the Tory campaign is based on fostering pessimism and spreading cynicism."